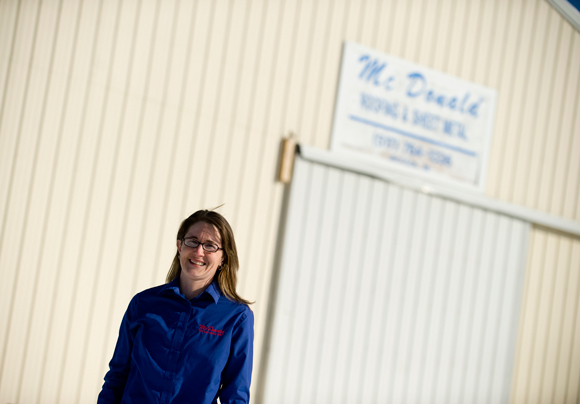 Danielle Wallace has broken through the roofing industry’s glass ceiling in Southwest Michigan. Wallace, 31, is McDonald Roofing’s lone female field employee. She is the face of the Detroit-based company’s Battle Creek office which opened here on Nov. 1. The local operation moves into its new quarters at 510 Columbia Ave. on March 1. McDonald’s Roofing, founded in 1947, also has locations in Jackson and Livonia. McDonald’s sister company, J.D. Candler began in 1879. Being union poses some unique challenges, especially when it comes to people’s perceptions, but Wallace says she has a ready answer for potential customers. Wallace, who was born and raised in Kalamazoo, got into the roofing business after her high school graduation. 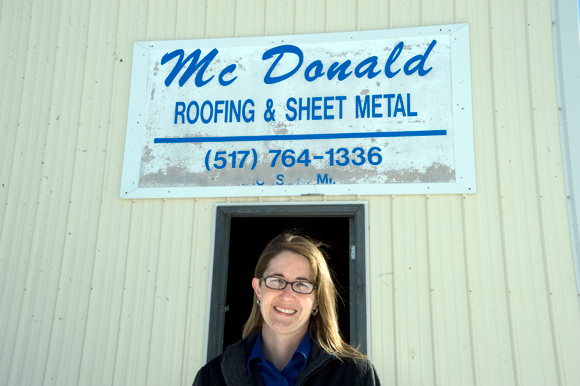 She spent 10 years at Chenoweth Roofing Company in Three Rivers before going to work for McDonald’s where she started as a sheet metal worker and eventually was appointed to her current job as a branch manager. The company’s Battle Creek location employs three people and across the three locations of the company 150 individuals will be hired during peak roofing season, which begins when temperatures warm up. Although the term “lifelong learning” isn’t always applied to the building and trades industry, McDonald’s employees are always learning new techniques and technologies designed to increase the life of roofs. The company focuses on commercial, industrial, governmental and school system roofing jobs, but Wallace says they also do some residential work. Their client base in Battle Creek includes the Kellogg Co. and the Calhoun County Jail. An increase in business here prompted the company to open the office currently operating out of Wallace’s home. In keeping with a growing demand for building “green,” McDonald’s is increasingly making “lean construction” a priority. This service and maintenance support has helped McDonald’s remain profitable throughout economic ups-and-downs. Wallace says it’s a relatively new concept in smaller cities, although companies in bigger cities have been using this method because it saves money. Simply put, McDonald’s takes their roofing expertise up a notch by integrating new technologies or working with customers to help them achieve their goals by offering fairly new options, such a solar energy, which will enable the companies and organizations McDonald’s does business with to get tax credits. The addition of components such as solar panels or reflective coating can potentially add another 10 years onto the life of a roof, extending that life to 30 years. Resurface coating may be applied several times to also increase the roof lifespan. Coating work originally comes with a 10-year warranty. Wallace says roofing companies should be able to go in, look at any deficiencies, and make the necessary repairs to add another 10 years onto the manufacturers warranty. “You can go up on the roof, cut a section out and see how much reflectivity has been lost,” Wallace says. In addition to the standard roof topping structures, McDonald’s is getting more requests for green roof systems that incorporate ground cover as a way to save energy and decrease the amount of harmful gases going into the atmosphere. These roofing systems typically cost about 30 percent more than a standard system. These roofing systems are more expensive at the outset than a traditional roof, but the future savings are greater. Wallace says she recommends making the investment when considering a new roof or a re-roof because trying to include it later becomes costly. The type of vegetation is a major consideration, especially in areas of the country where snow and colder temperatures are not kind to flowering plants. Vegetation is grown in plastic crates and the water, worms and nutrients continue growing from crate to crate. “There are so many different styles that hold heat in rather than letting it through and you can get a 50-year warranty on residential roofs, but they are more expensive to do,” Wallace says. She acknowledges the difficulty in getting people to see the benefits to a new roof, re-roof or the routine service and maintenance. 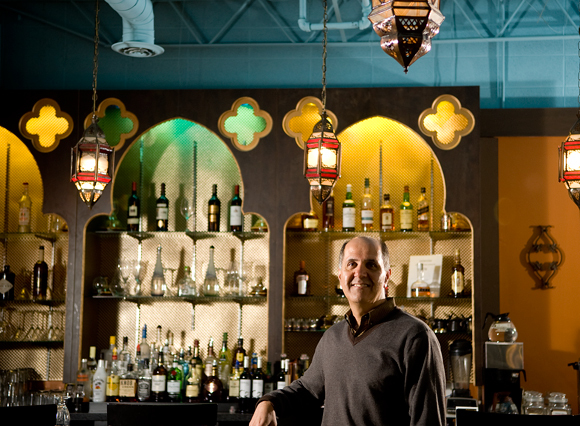 With three businesses and more on the way, the Mandwee brothers are sharing their culture with Kalamazoo. Writer Zinta Aistars talks with Habib Mandwee about making a home in the United States and sharing some of home with others.